Hi lovelies! Last month I joined Kimberley's brilliant Ambassadors of Kindness campaign which aims to spread kindness by everyone who takes part completing one act of kindness a day. Unfortunately due to a couple of things that happened in January and February I fell out of my blogging rhythm and along with that, I also didn't keep up with this campaign as much as I should have. However I am determined to make March a more consistent month! 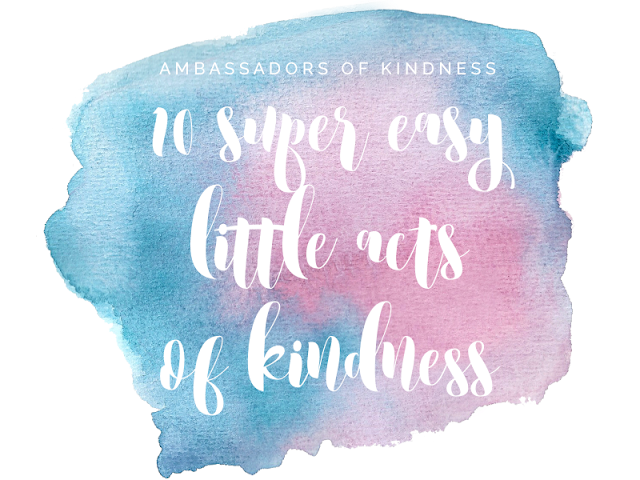 Until then, another way I wanted to help spread a little kindness is by doing monthly posts on 10 acts of kindness you can do for yourself over the next month! These are all super easy and while they may be small, the ripples they create can be much greater, so if you can try giving one or two of them a go in March! 2. Think someone looks cute AF in their selfie? Tell them! This is so simple but it always makes me smile when someone does it for me! 8. Follow any small shops or blogs on Twitter? Give one of their promotional tweets a retweet - it might very well make their day! As a cashier myself, this definitely makes my shift a lot lovelier! Remember to check out Kimberley's original post on the campaign to see how you can get involved yourself. See you in March for my next post!